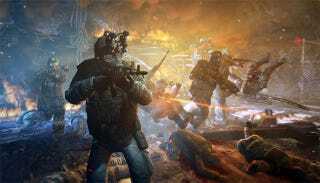 4A Games' Metro: Last Light is coming to the 360, PS3 and PC. It won't, however, be coming to the Wii U, because its developers say they are far from impressed with the new console. Speaking with NowGamer, 4A's Oles Shishkovtsov explains the reason pretty bluntly, saying "[The] Wii U has a horrible, slow CPU." Fellow dev Huw Beynon elaborates a little more helpfully, saying "We had an early look at it, we thought we could probably do it, but in terms of the impact we would make on the overall quality of the game—potentially to its detriment—we just figured it wasn't worth pursuing at this time. It's something we might return to. I really couldn't make any promises, though." "We had an initial look at the Wii U, but given the size of the team and compared to where we were last time, just developing for the Playstation 3 is a significant addition."